Thursday August 22nd 1899 Will and I took an early start to town and went over home for dinner. They were all pretty well came to do evening work. A lovely warm light night Wednesday August 23rd 1899 I was busy with the work a great part of the day About five oclock Will and I got ready and our things ready to take and went up to Stevens to meet with all the rest of the folks to go up to Willie Andersons to surprise them with a wooden wedding. 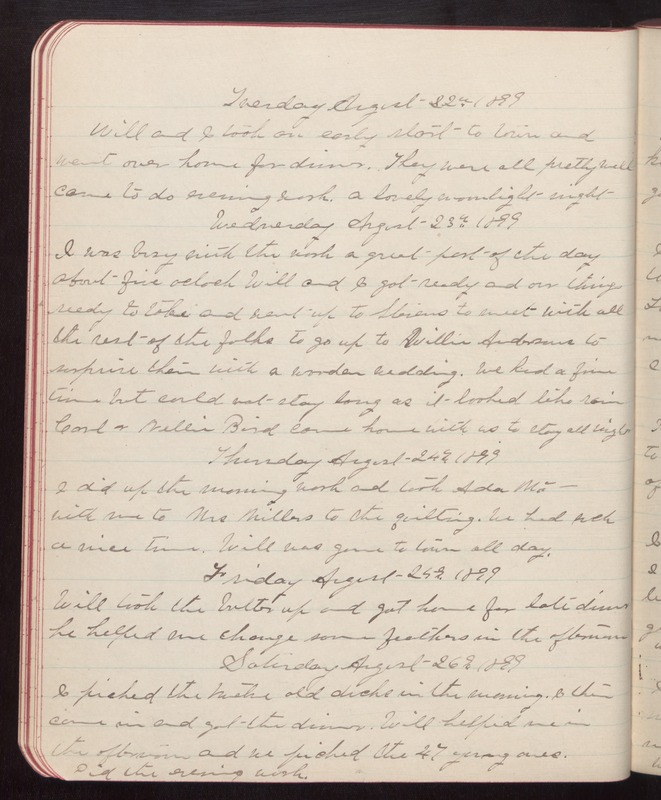 We had a fine time but could not stay long as it looked like rain Carl & Nellie Bird came home with us to stay all night Thursday August 24th 1899 I did up the morning work and took Ada Mc- with me to Mrs Millers to the quilting. We had such a nice time. Will was gone to town all day. Friday August 25th 1899 Will took the butter up and got home for late dinner he helped me change some feathers in the afternoon Saturday August 26th 1899 I picked the twelve old ducks in the morning. I then came in and got the dinner. Will helped me in the afternoon and we picked the 47 young ones. Did the evening work.